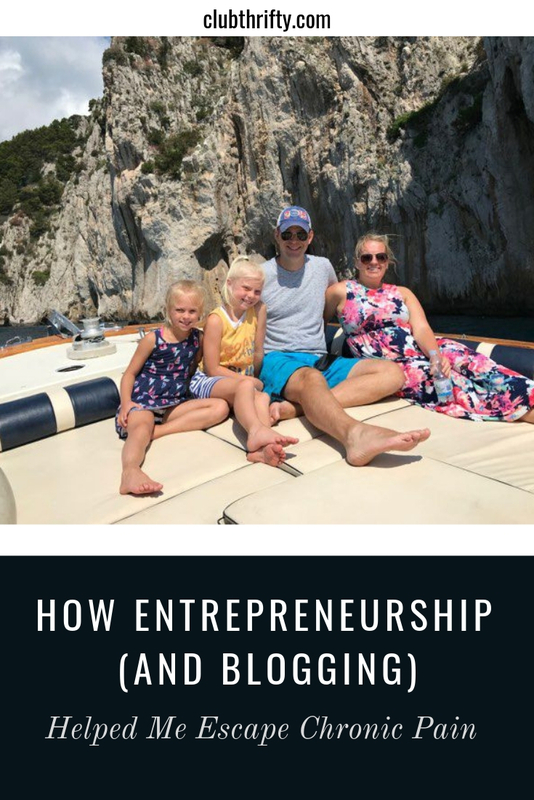 The post How Entrepreneurship (and Blogging) Helped Me Escape Chronic Pain appeared first on Club Thrifty. When I was in my early 20s, I waited tables at an Outback Steakhouse on the east side of Indianapolis. It wasn’t my dream job by any means, but it offered flexible hours that allowed me to go to school part-time. I also made pretty good wages if I do say so myself — at least for a kid with hardly any skills. But, it didn’t take long for that job to start wearing me down, mostly because it was hard on my body. During the months I worked there, the job itself became a hardship. Carrying dishes and trays and working 12-hour shifts was for the birds, but my pain only got worse over time, leading me to believe something was really wrong. One evening when my shift was over, I was in so much pain that I drove to the emergency room. My mother met me there and we quickly learned that I had spondylolisthesis — a condition that happens when one vertebra slips forward over another. This explained all my pain, but it also wreaked havoc on my life. I could no longer work at Outback Steakhouse or anywhere, and I needed to have a spinal fusion. So, that’s exactly what we did. I had back surgery that left me languishing in bed for weeks. It was awful, but I quickly learned that it wasn’t over. They had to do a second spinal fusion to fix what didn’t work well the first time. I basically lost a year of my life during this time. I eventually started back up in school, but it was difficult for me to work while I recovered. Eventually though, I regained some semblance of a normal life and moved on — mostly pain-free. In 2004, I met my husband Greg in person. This was after we were internet pen pals for several years! Yes, I met my husband on the internet and I’m #notsorry. By the time I met Greg, I was pretty normal. I hadn’t had chronic pain for years, and I lived a fit and active life for the most part. We had a normal courtship and married in 2005. I was so incredibly happy! Unfortunately, the worst-case scenario played out at a time when so much was going right. I was living pain-free when I was pregnant with my daughter Lydia in 2008, but I started experiencing chronic back pain pretty quickly after she was born. I worked as the Director of Family Services at a funeral home at the time, and working in chronic pain was absolute misery — especially with a small child at home. Completing the basic tasks my job required seemed impossible at times, and there were months when I couldn’t lift my daughter or carry her pumpkin seat to the car. My mom used to come to my house and help me when Greg worked late, mostly just to do the lifting for me. If I was in pain, I absolutely couldn’t lift my baby without making myself miserable. And if I was having a rare pain-free day, I was so scared to lift her and start up my chronic pain again. I owe so much to my mother for everything, but especially because she never made me feel bad by asking for help. She seemed to understand not being able to lift my kid without pain was the last thing in the world I wanted. I didn’t need to feel awful on top of that. Eventually, Greg and I got pregnant with our second child — a daughter named Vivian. Looking back, it seems like an awful decision due to my health at the time. There were a few months in between kids where I wasn’t absolutely miserable with back pain, but having another kid was sure to set things off again. I was soon back where I started after she was born, miserable and hoping and praying for my pain to go away. There were a few years where I’m not sure how I survived. For months at a time, I was in pain from the moment I woke up until I went to bed each night. I tried everything — back patches from the drug store, numbing shots in my spine, physical therapy, and a merry-go-round of office chairs. At work, I tried shirts with built-in support so I didn’t have to wear a tight bra that strained my back. Nothing really worked — at least not for long. When my second daughter was born, I even wondered about the possibility of getting approved for permanent disability. I would never have any money if I went that route, but I wasn’t sure I could live my whole life in pain, either. And disability was for people like me, right? I honestly didn’t know what to do, except that I wasn’t sure I could go on. Yet, something stopped me from giving up. Then, in 2012, Greg and I started this website. Of course, I needed another thing to do, right? In all seriousness, this website offered a welcome break from my life of pain. I loved writing blog posts whether anyone read them or not, and I quickly learned I had a knack for putting words to a page. I also found out that people would pay me money to write — and sometimes a lot of money. At least, it seemed like a lot of money to me. I started out writing articles for around $100 each, which is a lot of money when you earn less than $40,000 per year. From there, I worked my way up to where I was getting paid $200, $300, or $500 per article. Around a year after we started Club Thrifty, I was at an impasse. I was waking up at 5:00 a.m. to write before work and also writing evenings and weekends. And, keep in mind — I was doing it all with two small children and chronic pain that lasted all day and night. After talking it over with Greg, we decided that this was my chance. If I could replace even part of my income with freelance writing and our blog income, it would be worth it for me to be at home. I would still be “working” of course, but I could sit where I wanted, and I didn’t have to do anything that made me hurt worse. I was making a little less than $40,000 per year at the time, so my goal was earning $3,000 per month or $36,000 per year in freelance income. I was already reaching that goal during part-time hours, so I knew I could do it if I had 40 hours per week to write. I put in a one-month notice at my job, and I never looked back. A funny thing happened when I finally left my job. All my chronic pain went away within a week…and it never came back. It sounds crazy to say that, almost like it was magic in some way. But, that’s exactly what happened. I quit my job and all the pain disappeared. I think a lot of it had to do with the repetitive movements my old job required. I was constantly leaning for things and reaching for the phone. I also had to wear business attire that wasn’t comfortable at all, and obviously a bra that was tight across my chest. Looking back, I also know my old life was insanely stressful. It’s hard having two kids and a 9-5 job anyway, but I was constantly obsessing over the fact that I was in pain. I also dealt with anxiety issues (which I still have), and that didn’t help matters at all. But, working at home is absolute heaven for anyone who has dealt with chronic pain. Not to set off a TMI alert, but I rarely wear a bra or fitting clothes. I sit in whatever chair I want while I work and I am free to move to get more comfortable. Truth be told, I mostly sit around in pajama pants and free T-shirts I’ve gotten from conferences, and I have zero pain. None. Nada. Now that I’ve been writing full-time for six or seven years, I barely remember what it feels like to wake up each day dreading what’s next. I no longer wonder what my future will be like, or if I am doomed to grow more miserable over time. I remember the emotional toll of the pain, but not the pain itself. I’ve also realized writing and blogging is my calling. The work is difficult at times, but I love it! The money has also been *ahem* great. I earned over six figures my second year writing full-time, and my income has exploded to greater heights every year since. And of course, that doesn’t include the six-figure income from this blog or the income from my writing course, EarnMoreWriting.com. Most people will probably be surprised to read this from me. I know I come across as confident and unshakeable at times. My work ethic has become legendary in my industry and I am not a whiner or complainer by any means. And these days, I am living the dream! Greg and I have achieved many financial milestones that have allowed us to live life on our own terms. We travel around 16 weeks of the year, including spending at least half of the summer somewhere in Europe, usually in Italy or France. I’ve hiked the Swiss Alps, zip-lined on the world’s tallest and longest courses, explored some of the world’s most ancient and famous ruins, and vacationed on many of the most beautiful beaches in the world. And I’ve done it all on my own terms. Most importantly, I have become a better version of the parent I used to be. I’m a lot happier now, and that bleeds into everything I do. Escaping chronic pain paved the way for me to be a better mom, and that’s probably the most important gain I’ve made. Being a better parent is more important than the pain I left behind, and it’s way more important than money. But this is who I’ve become. Not too long ago, every day was an exercise in survival. I loved my life, but I didn’t love the body I was stuck in. I did nothing about it for years, at least until we started this website. Funny enough, I still marvel at the opportunity available in the online space. We make a living writing, blogging, and selling courses, but we have friends who earn a living doing things like managing social media or creating Pinterest images. There’s so much opportunity out there that it’s absolutely astounding. I only wish I had learned about it all sooner rather than later. I know not everyone with chronic pain can simply quit their job and start a business, but I do think the opportunity the internet provides is worth looking into. I never imagined myself living this life — free from stress and free from pain. And it all happened on a whim because my husband convinced me to start a blog. For that, I am eternally grateful. Next Next post: Is The FIRE Movement a Fad?